Veneers are strong, thin pieces of porcelain that are attached to the front of the teeth. Often made of porcelain or composite resin, they look very much like natural teeth. They are used to repair chipped, decayed or stained teeth and may help in closing gaps between teeth. With a bit of contouring, veneers may also correct slightly crowded or overlapping teeth. If your teeth have discoloured with age, a veneer may improve their appearance. With the current technology, veneer treatment is mostly a quick and affordable procedure. Please call us to book a consultation with the dentist to determine if you are a good candidate for veneers. A thin layer of enamel is removed from the teeth and the dentist takes an impression of your teeth, after which the veneers are custom made. 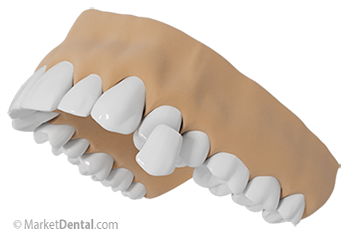 When your porcelain veneers are ready, they are glued to your teeth one by one, using composite resin cement. Years of drinking coffee, smoking cigarettes or eating highly pigmented foods eventually take their toll on your teeth, turning them an unattractive shade of yellow or brown. Veneers can be an easier way to whiten your teeth. If you have damaged enamel from overzealous tooth brushing or highly acidic foods and drinks, veneers can be an excellent solution to replace worn out enamel. Veneers can help hide slightly crooked or gapped teeth, or teeth that are chipped. Just like natural teeth, teeth with veneers need to be brushed and flossed daily. Some cosmetic treatments like veneers might not be covered by your dental insurance plan. If you grind your teeth constantly, your veneers might chip or break. If a veneer chips or peels off, or if a cavity forms under a veneer, the veneer must be redone. To set up a Free Veneer Consultation with our dentist, contact us now.